Coach Ricardo Cravo remained in temporary charge of Athlone Town for the trip to City Calling Stadium last Saturday night (April 29 ) to take on Longford Town for the third time this season. The caretaker manager had guided Athlone to a first win in nine games against Wexford, but Longford had little difficulty in making it three wins from three against their Midland rivals. Former Athlone player Enda Curran grabbed a hat-trick after coming on as an early replacement for David O’Sullivan. The sending-off of Jason Molloy just moments after his introduction late in the second half, when just a goal separated the teams, did not help the visitors’ cause. Curran took advantage of some sloppy defending to complete his hat-trick in stoppage time. From the first corner of the game after five minutes, Athlone were lucky not to concede an own goal as a sliced clearance almost ended in the net. Longford lost their ace marksman O’Sullivan after 10 minutes, but Curran proved to be a more than adequate replacement. The opening goal came midway through the first half when Don Cowan got the better of David Brookes on the right. His low cross into the danger zone fell to Curran whose touch sent the ball to the net from close range. The Athlone response saw Dragos Sfrijan beat the goalkeeper but his shot drifted wide. 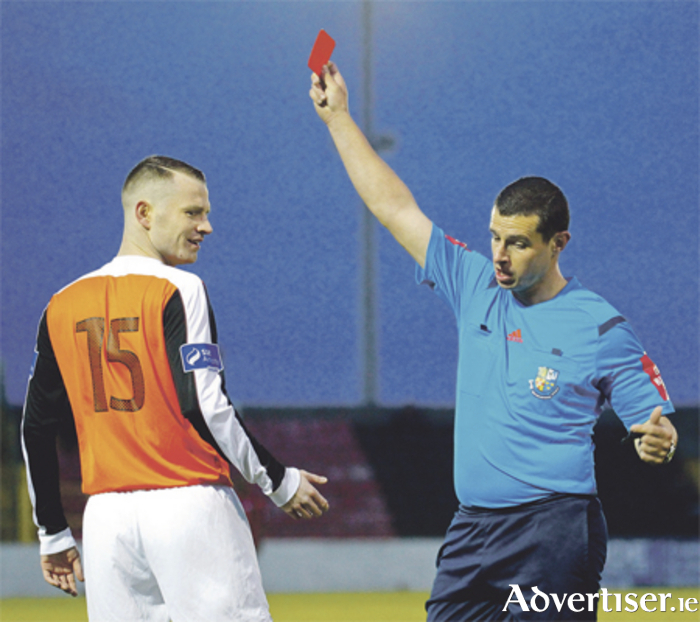 The game was to turn Longford’s way with two major incidents in as many minutes. Firstly, Walter Invernizzi thought he had equalised when the ball appeared to have crossed the line after bouncing down off the crossbar but play was waved on by the referee. Availing of the let-off, Longford then doubled their advantage from a free kick. Colm Coss committed the foul in front of the goal and Curran’s strike crept around the wall and under the body of goalkeeper Igor Labuts. Athlone reduced the deficit just before the break after Invernizzi had set up Coss for a shot on goal which was blocked. The ball then fell to Sfrijan on the right who shot to the roof of the net in spite of having a number of Longford defenders between him and the target. Athlone had few chances on the resumption of play with Jason Lyons and Niall Scullion failing to trouble the keeper with early efforts. Longford came closer through Dean Zambra, Curran, and Mark Langtry but the game still remained in the balance. However a moment of madness from substitute Molloy in his first contribution dashed all hopes of an Athlone comeback. A reckless challenge on Curran close to the touchline saw the red card being produced to reduce the visitors to 10 men. The last nail in the Athlone coffin arrived three minutes into stoppage time when Paul Skinner’s kick-out was completely missed by Sfrijan. The unmarked Curran had the opportunity to grab his third goal and he duly obliged lobbing Labuts who was off his goal line.